This really is one of the best meals, for a couple reasons. The first is that it’s delicious! Even though it’s vegetarian, it’s tasty and filling. You could certainly add some cooked chicken if you like, but it really doesn’t need it. The second reason is that it’s easy! Have the filling ready in advance, so that it will only take a couple of minutes to assemble and twenty minutes to bake. 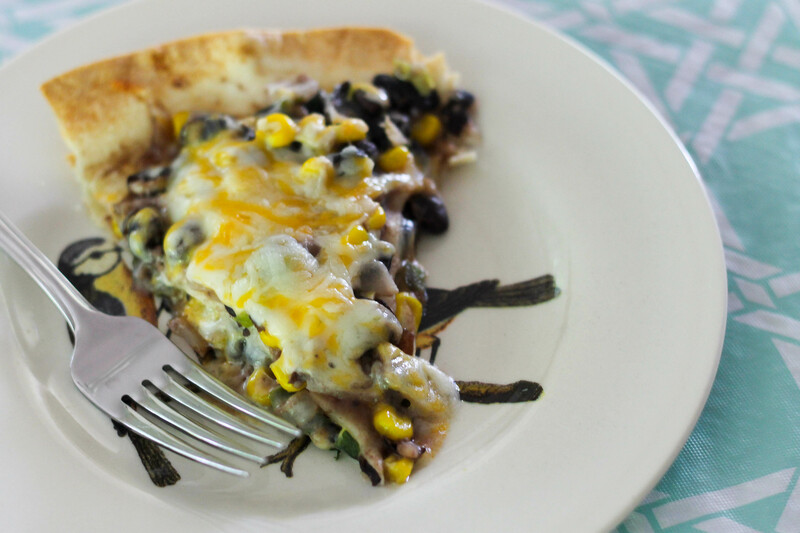 Serve the pie with a little sour cream, and you have a healthy and delicious dinner! Heat oil in skillet over medium heat. Add onion, jalapeno, garlic, and cumin; season with salt and pepper. Cook, stirring occasionally, until onion is softened, 5-7 minutes. Add beans and beer to skillet and bring to a boil. Reduce heat and simmer until liquid has almost evaporated, 8-10 minutes. Stir in corn and scallions and remove from heat. Season with salt and pepper. Fit a trimmed tortilla in the bottom of the springform pan; layer with ¼ of the beans and sprinkle evenly with some of the cheese. Repeat three times, using all of the remaining cheese on the top layer. Bake until hot and cheese is melted, 20-25 minutes. Unmold pie; garnish with scallions. To serve, slice into wedges and serve with sour cream and salsa. Side note: We baked our pie in two separate 9-inch cake pans because we couldn’t find our springform pan. If you prefer to use this method, simply use two tortillas per pan and divide the filling between the two.